Place entire pork belly into a pot and fill with cold water until fully submerged. Bring to a boil and boil for 2 minutes. Discard water and cool pork belly with cold water. Once pork belly is cool to the touch, cut into 1.5-2 inch cubes.Optional step: wrap each piece in kitchen twine to help the meat keep its shape through the long cooking process. This is especially important if you are using an instant pot or pressure cooker, and/or your pork has a high amount of fat. Layer the bottom of your pot with the sliced green onion and ginger. Place pork belly pieces skin side down on top of the green onion and ginger base. Add regular and dark soy sauce, the shaoxing wine, and water to the pot. Bring to a boil. In a separate pan, cook 2.5 tbsp of sugar with 1tbsp of a neutral oil (i.e. vegetable oil). Cook until it reaches a dark amber colour. Be careful not to burn the sugar. Once it reaches the amber colour, add to the pot with pork belly. 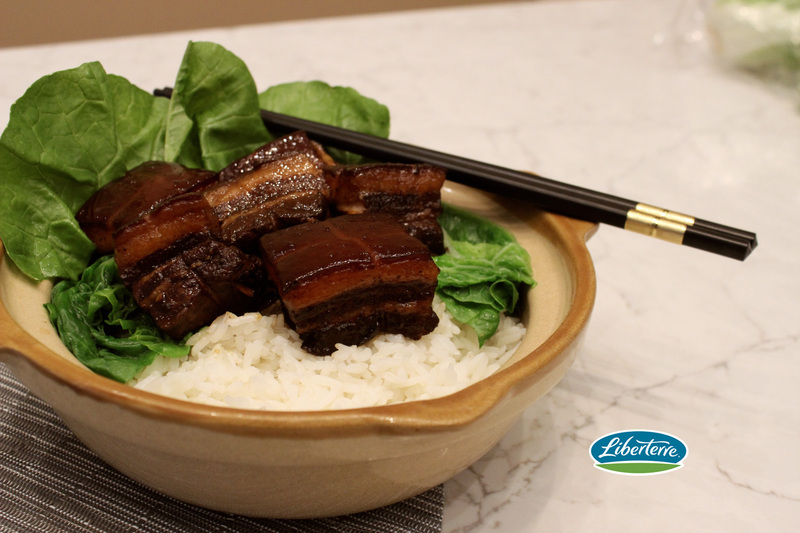 Bring the pork belly pot back to a boil, reduce to a simmer and let it simmer for 90 minutes. 90 minutes later flip the pork belly so it is skin side up. If you are running low on liquid at this point, add water. Simmer for another 90 minutes. Carefully take the pork belly out along with the ginger slices and green onion pieces. Skim fat from the liquid. Taste the braising liquid. Depending on the taste you may want to cook the sauce on high for a few minutes to concentrate the flavours. Remove string, spoon some sauce over the pork belly and serve with rice.